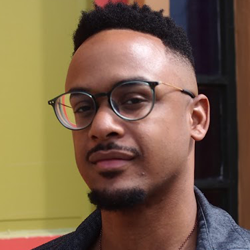 On April 24, we are grateful to have Brandon Sloan present a talk titled “Embodying Sacred Masculinity: Liberatory Movement Practices and Discussion.” This talk is open to all genders. Brandon Sloan Brandon (he,him, his) lives in Boston Massachusetts and is a formally trained physical therapist, somatic healer and actor who uses art and embodiment as tools for transformative change. Between 2014 and 2018 Brandon has studied and served in Shambhala, taking on several roles such as Meditation Guide, retreat leader/coordinator and co-facilitator of the People of Color Meditation Group at the Boston Shambhala center. In 2017 he assisted Lama Rod Owens in a workshop entitled Undoing Patriarchy and Uplifting the Sacred Masculine: a retreat for self identified male practitioners. He now serves on the board for the Boston-based non-profit BMEN: Black Men Engagement Network, co-facilitating monthly discussion and process groups for Black men. He is currently in collaboration with several Boston based artists and organizations to create and sustain spaces that serve two distinct purposes: create sanctuaries for queer people of color to rest and heal, and create works of art that invoke audiences to exam how identity impacts their lives.